Powerhouse all-in-one multimedia software offering conversion, ripping, editing, recording, burning, playback (including full playlist and full screen video support), and much more. Powerful, yet easy to use audio, video (VCD), and data CD/DVD burning are all fully supported. Other advanced features include video capture, video creation/combining/extraction, video editing, batch video processing, media management, audio merge, MusicID audio recognition, lyrics search, audio tag editing, CDDB/CDDB2/FreeDB support, and more. The audio content of video files can be extracted and saved to sound files, and frames can also be extracted to images files in batch mode. Video files can also be created from still frame images and/or other videos. Redesigned video editor, video batch processor, and video capture features; audio conversion expanded and consolidated; new supported formats; all existing features enhanced and improved; enhanced interface, all windows now skinnable; can now convert from MP2 (MPEG 1/2 Layer-2); VOX (Dialogic ADPCM); RAW audio (PCM, A-LAW, U-LAW); MPC (MusicPack); G.726, G.723, G.721; AIFF (Apple audio format); and AU (UNIX audio format) in addition to all the previously supported formats. player, viewer, encoder, decoder, cd ripper, converter, mp3, wav, cd, audio, sound, music, video, playlists, wma, mpeg, mpg, vivo, editor, recorder, avi, apple movie quicktime, mov, qt, midi, aiff, au, snd, batch Powerhouse all-in-one media converter (two-way among CD, MP3, WAV, WMA, OGG, MPEG-1, MPEG-2, AVI, WMV, FLIC, etc. 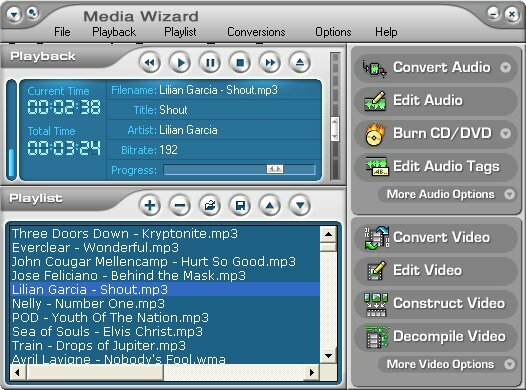 ), audio/data CD/DVD burner, VCD burner, complete audio/video editor and recorder, video creation/extraction/processing, and much more.